For the many people who want this Libyan dictator dead, there are others who are worried about the repercussions of his demise. CNBC reported the rumour this afternoon, claiming it is partially responsible for driving oil prices back down to $97 a barrel. Oil had hit a high of $120 a barrel late this afternoon, but settled at $97 on the rumour and on Saudi Arabia's claim that it can counter any supply disruptions from Libya. 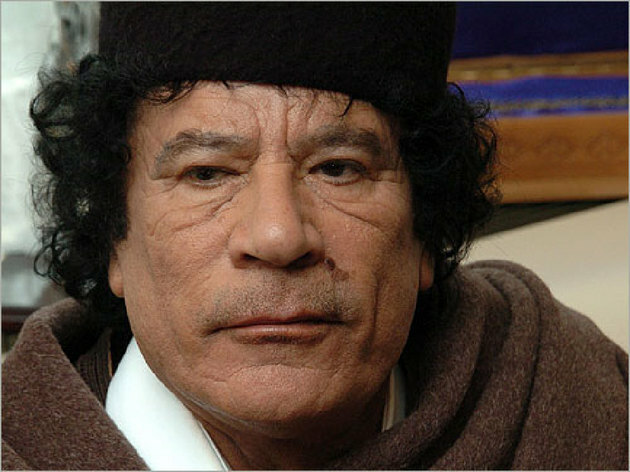 However, A U.S. official says there's no reason to believe Gaddafi is dead since there is no information on where the rumour came from and no news reports substantiating it. Reuters was also reporting the rumour as for now is unconfirmed. This news also comes after it was reported that influential Muslim cleric Yusuf al-Qaradawi issued a fatwa on Monday that any Libyan soldier who can shoot and kill embattled leader Muammar Gaddafi should do so "to rid Libya of him". "Whoever in the Libyan army is able to shoot a bullet at Mr Gaddafi should do so," Qaradawi, an Egyptian-born cleric who is usually based in Qatar, told Al Jazeera television. Stay tuned for any future developments.